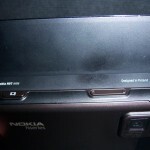 The Nokia N97 mini has got a 3.2″ display with 640 x 360 pixels, and is 0.3″ lesser than the Nokia N97 original, but what makes it more different is the thickness, which is easily noticeable. It supports 16 million colors, and has a pixel density of 229 PPI, which is why the display is sharper than the N97, and many other phones of Nokia N-series. This can be one of those phone which has a large screens, but won’t look like it, because of the compacting from every side. The phone can easily fit into the pockets, and handling it isn’t that hard. I would have loved it if there was a stylus provided along with the phone, as the touchscreen isn’t a touch capacitive but a touch resistive screen. The front face has something similar to the previous N-series phones – Light sensitivity sensors, front video calling camera. And the bottom has got one hard-hit Menu key, along with 2 touch-sensitive touch keys on its right, the Call and End keys. The right pane has the volume adjustment keys and the dedicated camera key, and the left pane has the slot for charger, along with the key to lock/unlock the keypad. The top section includes the 3.5 mm jack for earphones (which is another cool accessory I’ll talk about later). The back of the phone isn’t flat, didn’t impress me. Its because of the camera, which has got a raised position, which would have looked better if embedded into the body. The slider is superb, and has got the powered and sharp opening mechanism, which closes smoothly. The base which holds the upper portion of the phone, is strong enough to hold everything. It sounds like a hard click. Its going to be a mini-netbook like experience, when you have the slide opened to expose the keyboard. The keys are very well set, with a space between each of them to avoid the pressing of double keys with a single finger. The QWERTY looks all good, but while you type, there’s a small press which doesn’t make you feel if the key is typed or not. There’s an option to have your keyboard sounds ON/OFF and when on, they give you an amazing experience while you type. 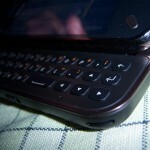 There isn’t always a need to use the external keyboard, because of the alphanumeric keyboard available on the touchscreen when someone prefers to use the phone without the slider opened up. 5 Mega-pixel, just like the others of same series, like Nokia N82, N85, N95 and N97. But am totally impressed with the quality of pictures when taken in the dark. The dual LED flash, and all details similar to what I have seen in Nokia N85, which am using since the past few months, actually produced better pictures comparatively, but overall the flash can’t be called a superior one to every other phone cameras around. Video recording is also appreciable. The default recording mode is 640×360 pixels, but you get an option to improve that to 640×480 pixels. It records at 30 frames per second. But as I mentioned earlier, the protruded camera section on the back isn’t that good as it removes all the flatness of the phone. And one thing I would miss for sure – Camera Shutter. 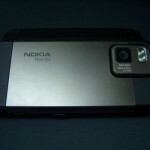 Now why did Nokia decide not to include that for such a good quality camera? There is no protection for the camera at all. Its the most risky to any damage or scratches when someone slides it over irregular surface. 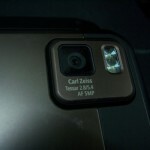 The camera has a Carl Zeiss lens, along with the dual LED flash and the other settings and options are the basic ones similar to the other Symbian S60 devices (one can’t expect anything new there!). 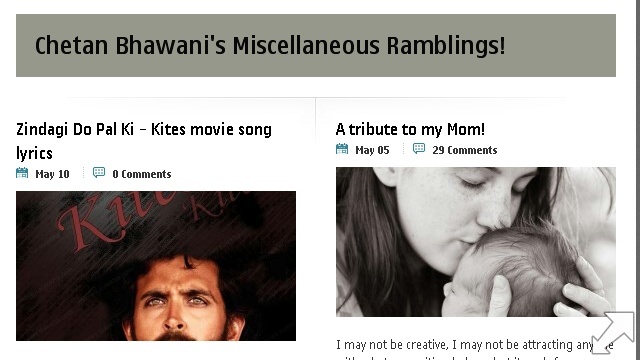 You can share the pictures directly to Ovi or Vox. Welcomed with a clustered homescreen, which is interesting for one who is more into networking, but for others its more confusing than exciting. There are 6 widgets which can be edited and arranged according to your wish, but by default you get to see the options to open Messaging, Web, Ovi store, Ovi Maps, Search, Calendar, Camera and Photo Gallery. 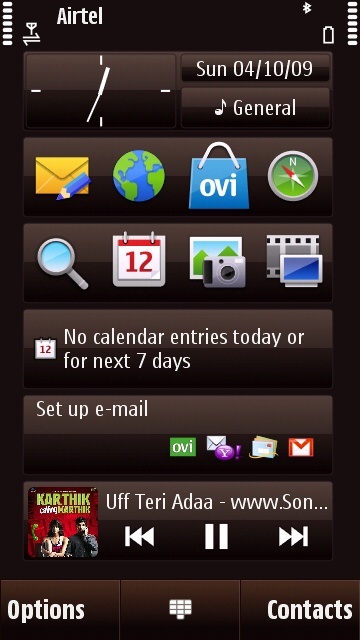 Other widgets include ovi email account, and music player. The interface is not what one can boast about. 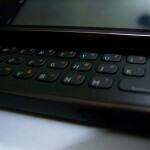 Its the basic Symbian S60 5th edition, that you see in Nokia N97, Nokia 5800 and any other Nokia touchscreen device. Everything internally is the same. Real player, Qik, Boingo, Viingo etc. come preloaded and preinstalled. Symbian brings the easiest interface for user of any level, but one gets bored and feels the lack of good experience when the same is being brought into every phone. The same could be felt in the Nokia N97 Mini, where it deserved a better interface. Think about it.. Nokia with the new Maemo OS, would be awesome. Just tried to check how much speed the phone can run, when multiple apps are open at once. 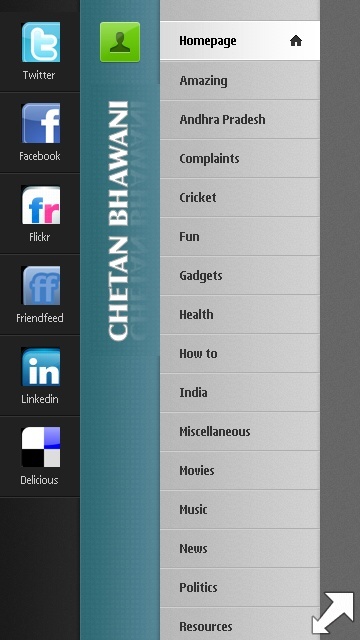 Opened 7 apps that include Gravity twitter app, Web, Opera Mini, Calendar, Messaging, Music Player and Photo Gallery. The phone speed didn’t get affected much, also switching from one app to the other was pretty much as normal with no fluctuation in the speeds. 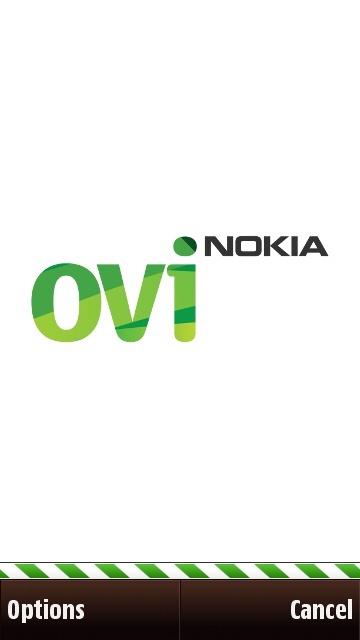 But the phone crashed when I tried using Ovi Maps, Ovi Store along with a couple other apps. Still, pretty much impressed with the speed. Multitasking is where Nokia beats iPhone totally. Could you really use more than couple apps at once in an iPhone (2 apps = iPod in background, and one app in front)? The basic web browser is pretty simple, and browsing is simple, but IF the interface as I said before, had features such as multitouch and pinch to zoom, the experience would have taken the next step. I still would prefer using the Opera Mini rather than the default web browser, and suggest others to use the same. Its superior to Opera Mobile, and Skyfire too. The fullscreen mode is pretty good, and you need to double tap the screen to zoom the page in or out. The problem with Symbian is that when you open the web browser and connect to the internet, opening any other web application again asks for the access point to be used. Can’t it just run the other app in addition to the present network? The multimedia includes Music player, and the video player. The video format allowed is MPEG-4, and the 640×360 pixels format, and the pixel size and configuration provides clear video output. Real player app comes by default. Music player provides a high pitched sound, which I won’t compare with a Sony ericsson walkman series, because its no where near to the quality of that provided by the latter. One accessory that comes to bring a better experience is the stereo headset, with the music control keys and call activation key. It provides a good sound quality when compared to the external speaker quality, and the bass provided is awesome, but I would have loved a bit more sound through the headset. Did not test the battery fully yet, but still a full charge 36 hours ago, has around 50% battery still remaining. It was played much with various apps, camera etc. but still fast draining of the battery was not seen. Can’t totally judge it right away though. Its a BL-4D battery, thinner to pack into the compact design. The phone comes with an internal memory of 8 GB which can be expanded through a memory card slot. I’m yet to check the camera comparison with other 5-megapixel camera phones. To start off, if you are an iPhone user already, or using any Windows Mobile device, stick to them. Because, its not the design only what you would look for. And Symbian wouldn’t pull you away totally. 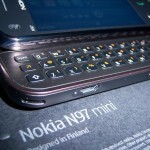 But if you have been a Symbian user, you would love to enjoy the N97 mini. Its a beautifully designed phone, with a slider I loved to play with. Pricing for the phone is not too high, at Rs. 23000 (Nokia mentions the UK pricing as 389 pounds) in the Indian Market while writing this review. 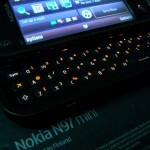 Its totally better than the elder sibling N97, in the pricing and the compactness. Of course there are a few cons of this device – I needed a shutter for protection of the camera. The interface and OS, if improved would have been awesome. There should have been some other app for video playing, other than Real Player, as it isn’t supporting all the codecs. Its a good phone to go for, if you are planning to have a QWERTY keypad with good connectivity options, good display and a nice camera all packed in a not-so-very-big piece. It gets 3.5/5. A great review. The web browser looks neat and the landscape mode too is good. How much is the resolution of the photos taken with the 5MP camera? I’m pretty sure the picture quality is great. But as you mentioned there, a camera without a shutter won’t be the same for long. A few scratches, and all the quality goes down. 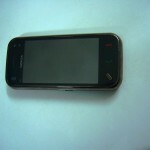 The phone might beat the iPhone 3G and 3GS by having a dual-LED flash with the camera, which lacks in the iPhones. Any news about the current pricing of the N97 Mini?